Book Challenge Day 20- Book You’re Currently Reading | What are we...the Whos? I was so excited to start reading this book. I expected it to be a true, gripping tale of a tragic life. A memoir that started as a complaint letter to an airline promised to be real. I hate it when books become “dolled up” with fancy language for the sake of entertainment and I was sure that this book would be nothing but blood and guts- no room for fluffy imagery when you’re bitching to an airline. But, and I hate it admit it, I was wrong. So very wrong. So far, this has been the exact opposite of what I expected. EVERYTHING is described with a hyperbolic metaphor or smilie. The sentences that do not contain overdone comparisons are, instead, cliches. I am actually struggling to get through it because every few sentences provoke a groan. It’s like he sat in a high school English class and thought “I’m going to include ALL of this in my book- that will make it literary genius!” I’m probably coming down a little hard on Jonathan Miles-He’s got a book published and I don’t- who am I to judge? Maybe the book gets significantly better. Honestly, I’m not that far into it. So fingers crossed that I’m just oozing compliments by the end. 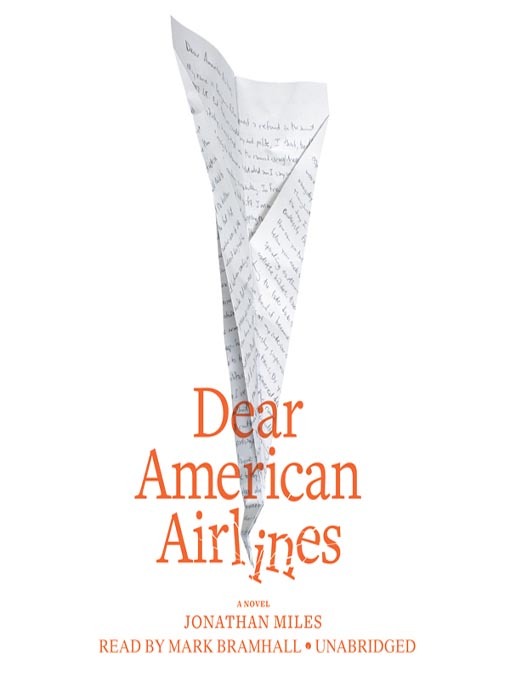 Posted in Authors, books, Reading and tagged 30-Day Book Challenge, Dear American Airlines, Jonathan Miles. Bookmark the permalink.